As part of our Fans View feature, Gerry Johnston spoke to Valencia fan, @mulu83 about the season ahead, transfer targets and the changes made at the club. Valencia finished 12th in La Liga last season. Were you disappointed with that or were you happy that they finished so high after being close to the relegation places for so long? Valencia have to be disappointed with a 12th placed finish no matter the circumstances. Also, after Voro turned the situation around there seemed to be a momentum and actually an option to get close to the last EL spot. Then ensued a period of bad performances again. All in all it was a shambles of a season with the meaningless decision first to give Ayestarán a new deal, then only to sack him 4 matches in. The whole Prandelli tenure was a weird one too, culminating in him walking away because Zaza wasn’t signed. Days later Zaza did arrive, as we know. Then there’s the squad planning, or really lack thereof. Only Jorge Mendes saved it from being a total disaster through facilitating Mangala and Garay at the very end. What is the latest in the long running dispute between Peter Lim and the clubs fans? Well, this is a huge topic, I could probably spend hours on. I’ll cover three main topics. Firstly with regards to the influence of Jorge Mendes this has, despite his facilitation of some deals, been severely reduced. Secondly, and related has been the lack of structure at the club after Salvo, Rufete and his scouting team were replaced by a Mendes supply line. It seems Lim has understood finally that you cannot build a team that way. The introduction of Mateo Alemany who has experience from the Mallorca side that had Eto’o has been popular. So has the introduction of Vicente Rodriguez and his scouting team, while Alexanco’s hiring as sports director was criticised due to lack of experience and the fact he was not chosen by Alemany, which would be the normal procedure. Lastly you have the disagreement with the Curva Nord. It is not directly linked to Lim as it actually started under Salvo. It has however escalated over the last few years, culminating in the group being absent for a number of matches. The changes in the club structure and in the Curva has improved relations and solutions are now in place. The expectations fans had when Lim arrived, were maybe not realistic and he could never live up to them. While Salvo built enthusiasm around the club and the sale, this also created the expectations and the fall was therefore much higher. The fall itself though has been through Lim’s failure to understand the world of football and a number of peculiar decisions, like hiring Gary Neville. It will take years and consistent improvement to rebuild trust between fans and ownership, if it is even possible. Alemany & Marcelino are a good start. Marcelino has been appointed manager of Valencia. What are your thoughts on that appointment? I was actually against hiring Marcelino last year, mainly because of his somewhat heated exit from both Villarreal and previous teams. During the year that has passed I have however grown very fond of both his way of managing, his playing style and not least his strict requirements of the players. Lim is not the only one blamed for the bad performances, as few of the players are seen as anything more than mercenaries by many fans. What will be very popular as well is his focus on allowing space for the club’s youngsters, a source of great pride for the city. The Mestalla, Valencia’s B-team had a great season, making it to the playoff final, after being expected to fight relegation. Almost all of the players who played the majority of matches will either play for teams in Segunda, or they will join Marcelino’s preseason. The fans have a strong belief in Marcelino, probably the first manager they have thought so highly of in many many years. He is, at least in theory, exactly the medicine Valencia need. Valencia have signed Nemanja Maksimovic as well as making permanent the loan deals for Simone Zaza and Fabian Orellana but they have lost Mathew Ryan, Enzo Perez, Pablo Piatti and Yoel Rodriguez. Are you happy with business so far? All of the business you mention has been planned since last summer or January (loans with mandatory clauses), so there is really not that much news. We always knew Ryan or Alves would have to leave, but were surprised when it was the Australian for a relatively low price. In the end that was a decision by Marcelino who wants a different kind of goalkeeper, so Alves will also leave. In has come Neto from Juventus for the same price as Ryan left, a goalkeeper who has more of a commanding presence behind the defence. Valencia fans are understandably concerned by the lack of progress in the market, as Marcelino wants between 6 and 14 new players and wants to let several go as well. A thorough restructuring has been requested by Marcelino so he can launch a bid for a place in Europe next season. Both Marcelino and the club have admitted the market activity could drag out until the very final day. A defensive midfielder has been missing ever since Albelda left so that would be very much appreciated. As would a central defender to replace Mangala. Fortunately Marcelino agrees and speaks his mind loud and clear. I expect that voice will be heard. With the club’s financial situation , patience is a necessity. In addition I also agree with Marcelino in the need of another central defender, a midfielder and a winger. Finally, I would bring in a striker of the Marcelino kind; more dynamic and pacy than Zaza/Negredo. Valencia have been looking at several players for those positions, including Albiol who had a Valencia friendly clause of 6 million. The club however decided not to exercise it before it expired on July 1st. The club also had a bid rejected for Ivan Marcano of Porto, while Jorge Meré’s situation is being observed. Marcelino wants experience in defence, so the latter is not a first choice. In the defensive midfield role Milan Badelj of Fiorentina has been the main name. It seems Valencia are playing a waiting game with the Viola. Other midfielders linked lately are Lemina (Juventus) and Kondogbia (Inter), both for loans. There hasn’t been many wingers seriously linked, so it seems that is not the main priority yet. I think it is absolutely critical to get in a defensive midfielder, so if we can pull off the signing of Milan Badelj it would be key for the club. He has been strong for Fiorentina, as well as for the Croatian national team. He seems to be able to fill the defensive role, as well as pulling the strings in a “Bruno” kind of role for Marcelino. Is there anyone in the squad that you are concerned might be tempted to move away from Valencia? There is only one I would have concern over; José Luis Gayá. He is a local lad who has established himself at a high level. High enough to earn interest from important clubs. He is not a player Valencia want to sell, but he is a player we could sell to raise money for the restructuring. Valencia left backs must be a well branded product by now….and more are on the way! Of course Soler is on the list too, but the size of bid it would take to take him off Valencia’s hands, is not coming. Finally, local talent should be kept and eased into the first team. If we can build a foundation of Valencians, nothing would be better. Valencia CF will play eight matches in seven different countries this pre-season. The first two games will be played in Switzerland against FC Lausanne Sport and Sporting de Portugal (on the 11th and 13th of July). The next match will be in Tunisia, against Étoile Sportive du Sahel, on the 16th of July. After that, Marcelino’s side will cross the Atlantic to play in Canada against the NY Cosmos and in the USA where they will meet FC Cincinnati, on the 22nd and 24th of July. On the 30th of July the squad will travel to the UK where they will take on AFC Bournemouth and, on the 5th of August, they will play in Germany against Werder Bremen. 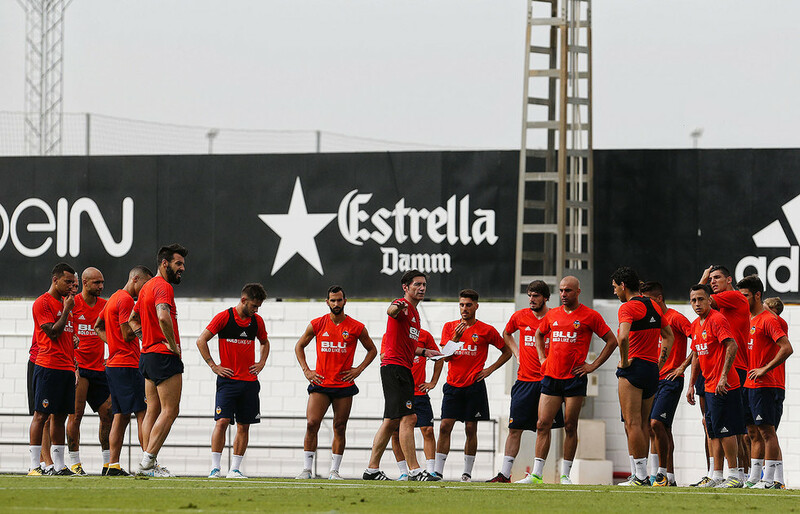 Finally, on the 11th of August, the Trofeo Naranja Estrella Damm will be played at Mestalla against Atalanta BC. I guess Soler & Lato already introduced themselves last year, so I am going to mention Nacho Gil. He is the brother of former Valencia and Aston Villa player Carles Gil and has a similar playing style, however he appears quicker. He was the best player for Mestalla last season from his inside forward position. There is an opening on the wings for Valencia this year, so he could have an opportunity. The question is if he will be able to make the leap directly to Primera already this year – it is a big one! Honourable mention for Nacho Vidal, an exciting right back who is expected to be Montoya’s backup. What are Valencia’s targets for next season? Valencia have set the objective at returning to Europe. This is both a financial necessity to keep on progressing, as well as a sporting one with a view to further improve the squad in the future.